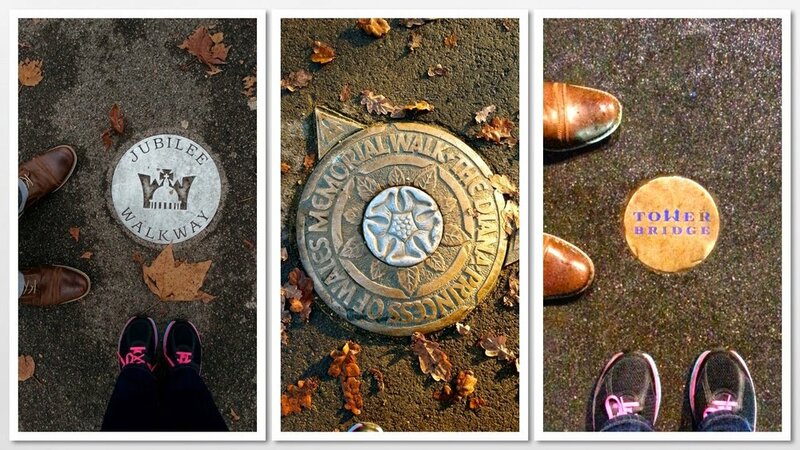 1.London is really well marked. You'd pretty much have to try to get lost to get lost there. In the central London area, there are these awesome maps every couple of blocks that tell you where you are and point out some cool stuff in walking distance from you. They make it so easy for tourists. 2. The public transportation systemrocks. Between the above-mentioned walking maps, bus system, railways, and of course the storied underground system, you can get anywhere so easily. 3. There is old gum everywhere. Little round circles all over the sidewalks. But it's not sticky at all. God knows how old it is. I probably walked over a a disc of Jack the Ripper's old gum when I strolled through Whitechapel one night. 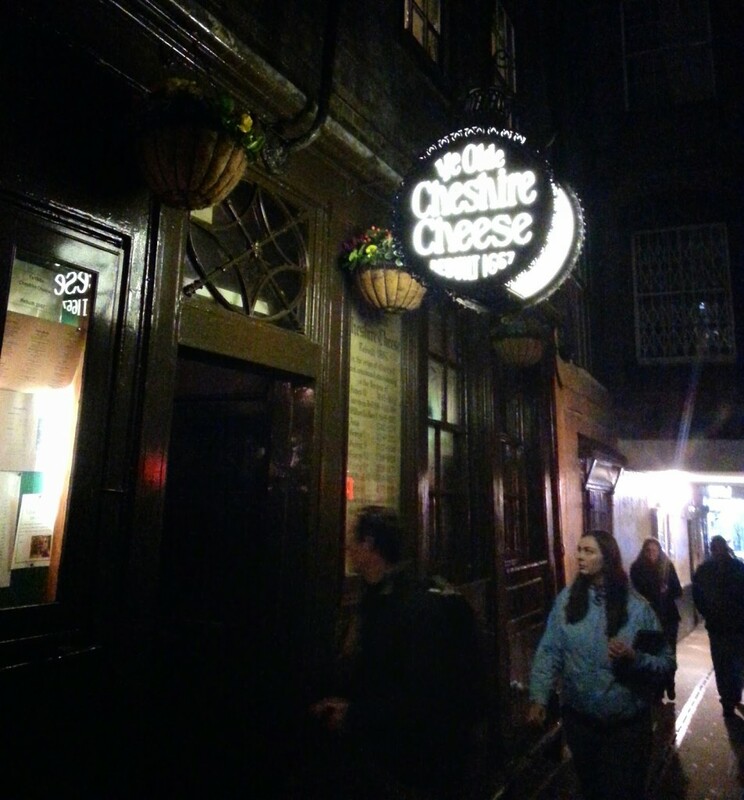 Ye Olde Cheshire Cheese, apparently the oldest pub in London. 5. People are more polite there. I don't know if it's the accent or the nationalized health care, but people just seem nicer in London. They hold open doors for you. They look you in the eye when you talk to them. They say things like "Cheers, mate." I only came across two cranky people when I was there and they were both Heathrow airport employees, so I'm pretty sure they were just fulfilling their required monthly Airport Employee Crankiness quota. 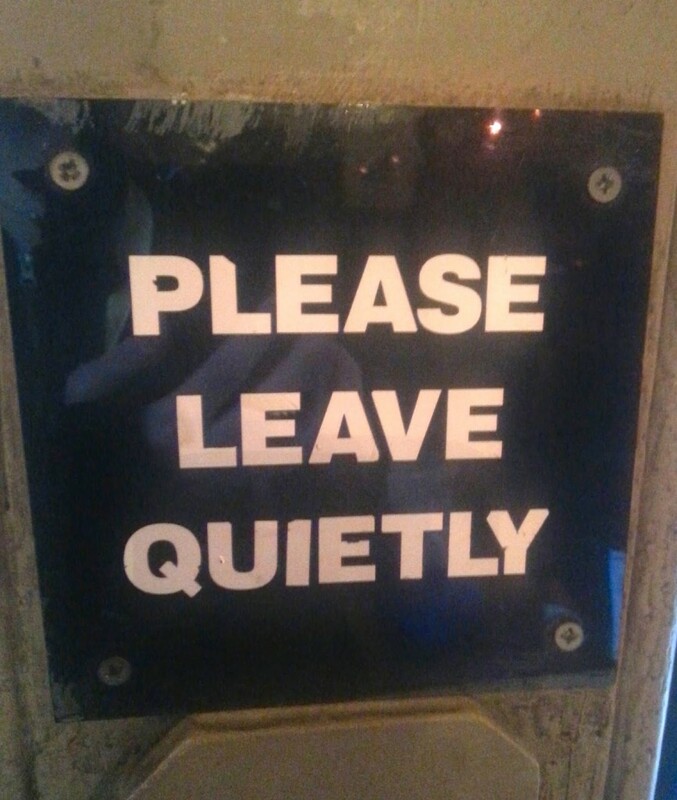 Even their signs are polite. 6. 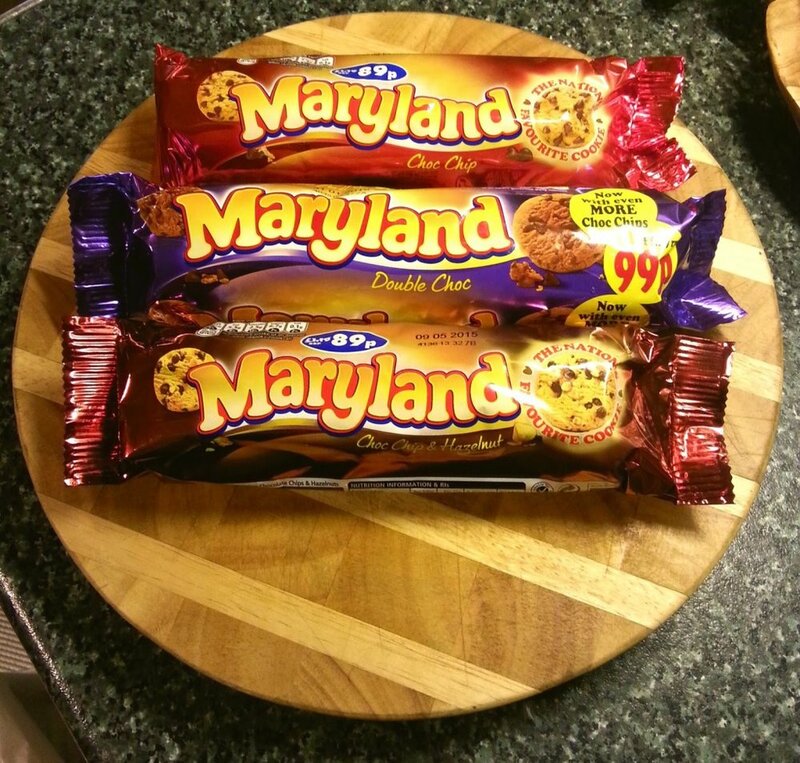 There's something called Maryland cookies and they come in sleeves and are basically Chips Ahoy but way better because the sugar content is different and hello they have "Maryland" in their name. A couple sleeves of Maryland cookies served alongside a piping hot cup of tea, and you're good to go. 7. You could spend days, weeks, months, just exploring the city. I can't tell you how many times Joe and I were beelining it to some tourist attraction, glanced down a side street, were instantly intrigued, and made a detour. We made some of our best memories that way (including #8). 8. There is a Twinings tea store and it is amazing. I had a royal teagasm when I saw it (one of the stumble-upons mentioned in #7). It turns out it's the original Twinings store, opened in 1706 (see #4). So many flavors. So much tea. And I now officially know from an official Twinings employee that it's pronounced TWINE-ings. 9. William and Kate were not at home the day I went to Kensington Palace. That's the only possible explanation as to why we didn't bump into each other and instantly become best friends. Their pet swans looked very cute with their rear ends silhouetted against the sunset, though. 10. Westminster Abbey is stunning. Breathtaking. Amazing. Phenomenal. I could have spent the entire day there (and pretty much did). I highly recommend the phone-like audio tour they offer for free with your admission, and I even more highly recommend talking to the people who work there; we found a small square tile commemorating the man who invented time (well, Greenwich Mean Time, a.k.a. How the entire world keeps track of the human construct known as Time) by asking an employee about the meaning behind a marking on the tile. Oh, and I visited the tombs of Isaac Newton, Charles Darwin, and Elizabeth I. HELLO. Westminster Abbey -- definitely a must-see. 11. The London Eye is really cool. A 360-degree view of London from a slow-moving Ferris wheel-gondola hybrid. Plus, we lucked out and got on without having to wait and there were only four other people in our car. Super lucky for such a major tourist attraction. 12. London butchers know about Thanksgiving and they will royally screw you when you go to pay for your Thanksgiving turkey. Turkey was $6.99 a kilo the Monday before Thanksgiving, and on Thanksgiving Day we paid seventy quid for a 5.5-kilo bird. I don't need to consult Isaac Newton to check that math. But good GOD it was the best turkey I've ever had, and it was slaughtered that morning - you can't get much fresher than that. 13. I have no idea how to convert kilos to pounds. Or pounds to dollars. Or grams to pounds. So many different kinds of pounds. And somehow quids work into that. 14. Netflix is different over there. I logged into my account through my brother-in-law's Apple TV, and lo and behold stumbled upon dozens of British TV shows I'd never even heard of. I binged watched the entirety of Gavin & Stacey and Extras and still had time for everything else. 15. They've already gotten through Season 5 of Downton Abbey. I found it. On Demand. An hour before we had to leave for the airport. So close. 16. London in November/December is cold. Well, not so much cold as it is clammy. It's dark and damp and it gets dark at 3:30 in the afternoon. Not helpful when your body refuses to adjust fully to the time change and you don't wake up until ten thirty in the morning. 17. The myth about English food being disgusting is a dirty lie. At least in London. They are so good at pies. I had a chicken and mushroom pie that was so comforting it almost made me cry. I'm really glad I was walking 10+ miles a day, because I ate all the food. All of it. Pie and chips and a Guinness. Happy girl. 18. One of the best sightseeing spots in London? The front row of the upper level of a double-decker bus. It's like having a panoramic view of life in London, from the comfort of a surprisingly clean and climate-controlled environment. And as I said in #1 and #2, it's so easy to get where you want to go. We sat there and watched the hordes of Black Friday shoppers herding themselves down Oxford Street. Of all the traditions to bring over from America, they chose Black Friday. Argh. 19. Taking selfies with Joe is fun. Taking selfies with Joe in front of Buckingham Palace, Big Ben, and the Tower Bridge is really fun. 20. The Millennium Bridge is so many things. A beautiful marriage of art and engineering. The gateway to St. Paul's Cathedral. An opportunity for die-hard Harry Potter fans to reminisce about the thrilling (and chilling) opening sequence of the sixth movie. 21. From this day forth, Guinness is the new Jell-O when I'm in the UK. As in "There's always room for Guinness." And hot chocolate. Let's drink all the hot chocolate while roaming the streets of London on a chilly November day. 22. Every single inch of London has character. Crumbling medieval walls. Ultra-modern, unmarked building lobbies that could easily be the secret headquarters of MI6. Winding alleyways. Hidden gardens. Towering columns. Ornate gilded gateways. Quaint storefronts. Charming side streets. Every section has a vibe, a culture, a rhythm. 24. You can spend entire days exploring the markets.Borough. Portobello Road.New Spitalfields. (Or for that matter, Old Spitalfields). In the span of one city block, we found antique telephones, mounds of fresh produce, old printing press letters, meringues the size of my head, and a collection of vintage compasses and telescopes. 25. At the Tower of London, there are stairs that lead straight into the River Thames. They've got these really cool Medieval-looking gates at the end of them. I like to think that before they built a promenade around the perimeter of the building for the tourists to walk on, there were no stairs and the watery passageway, just wide enough for a small rowboat to get through, led to creepy things like the Traitor's Gate. 26. If jet lag causes you to arrive at Kew Gardens after dark, it's totally okay. Because Christmas at Kew is awesome and sparkly and cheery and yet another excuse to drink hot chocolate. As if you need one. 27. It is entirely plausible for you to wake up in the morning, gaze out the window as you sip on a freshly prepared cup of tea, and see a happy red fox galavanting around the courtyard, repeatedly tossing a crab apple up into the air with his mouth and swatting it down again with his paws. And it will feel like the most English thing you've done all week. 28. You should never, never, never ever try to scale the walls of the gardens at Buckingham Palace. You will skewer yourself for sure. 29. Having the chance to spend a holiday with the love of your life and his recently expat-ed brother in what is now your favorite city in the whole wide world is absolutely priceless. And expensive. Which is ironic because it's priceless. P.S. One more thing - in London, they don't refrigerate their eggs. Seriously. Eggs are just sitting there on shelves along with the bread and spices and stuff. Craziness.